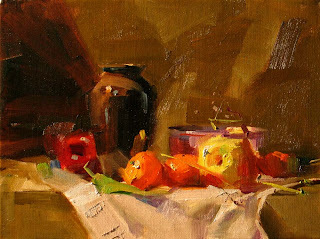 This painting was my second demo at the Magnolia workshop. You probably noticed I use more and more complete dark background recently. I got a little bored with my dark triangle on the left corner type of background design. I think you may get bored as well. You are experiencing the growing process of my art. At the beginning, I didn’t know what I was doing. I simply just paint. Then I developed some comfort zones. So you see similar paintings. I did stay in those comfort zones for a while so I could adjust the fine structures. Now I think I am in the third stage of growing. I come out from my comfort zones and explore new possibilities. We may experience together that my painting quality could have some fluctuations, but it is natural. We have to go through the growing pain. I just came back from Magnolia, TX teaching a workshop. It has been the third year I teach at ARLC. Ms. Marty Hatcher did a superb job organizing these workshops. Thank you so much Marty. 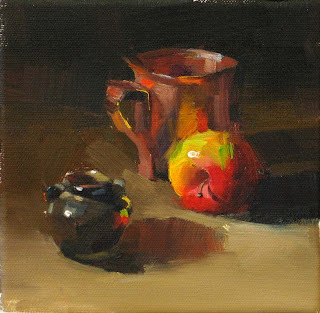 I was so enjoyed meeting wonderful artists in the workshop. Thank you all very much. This painting was my first demo. 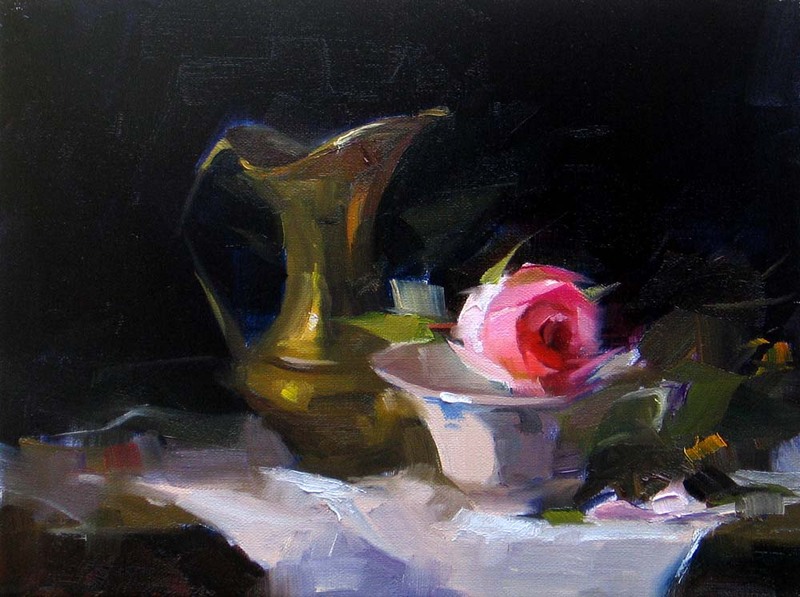 The dark vase captured the cooler light made this setup so enjoyable to paint. I apologize that I have not posted for a while. It is the tax time and I have spent my already very limited painting time in bookkeeping a lot. I felt so wonderful for a week that my recent reduced time at my engineering work spared me some day light so I did a couple of plein air work, but I went back to my old working hours last week because I need to squeeze some hours together (you know physicists can do that) for the workshop. However, I am confident that my life will be more in control in the future. So please do not worry, and be happy. 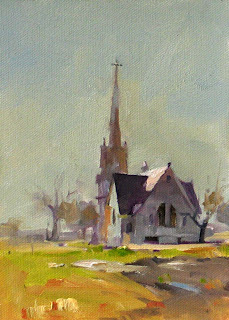 On Thursday morning, I joined the Plein Air Austin group and painted this beautiful church. It was so wonderful painting with PAA again. I was a member for many years, but have not been active for a long time. This paint out was arranged by my friend Robert. As a matter of fact, he scarifies quite a bid finding this location. Several years ago. Robert was bicycling near Manor, Texas. He had a bad fall on a country road and lost two of his front teeth. With a blood covered face, he stood up and found this beautiful place. "What a painting it is!" Robert thought. Now he is back and with many artists coming with him. I felt quite good about what I did. The greys work nicely. I appreciate so much that many friends sharing their grey recipes with me. I can't wait to try them all. 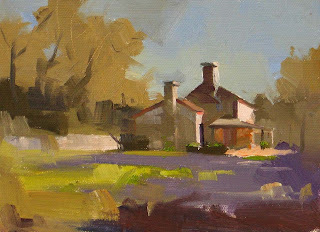 I did this little plein air sketch this morning. This is an old log house located very close to where I live. Compared with my painting posted previously, I felt a little better. I am working on the foundation of my plein air paintings. For this one, I am paying attention on mixing greys. I was using ultramarine blue, cadmium orange, and Naples yellow to get the grey for the shadow of the house. If you have good ways of mixing greys, would you mind sharing them with me? 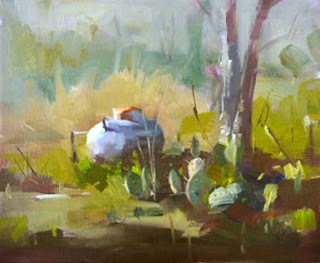 I did this plein air painting the afternoon in the Texas Hill Country. I felt great painting outdoors, but the painting was very challenge to me. Since I have not painted much plein air. The scene was overwhelming, the colors were different. I was out my comfort zone completely. I can't use my still life approaches here. This is my first time painting cactus. I really don't know what I was doing. I let my intuition take the lead. My colors were undefined, and my composition was accidental. I just simply paint. So if you feel you don't know how to paint something, you just simply paint. This is another painting I did in the morning. We have this peach tree growing in our back yard. We didn't plant it. It must come out from the compost pile my wife made. The blossoms are so beautiful giving our yard full of spring. I must paint them before too late. 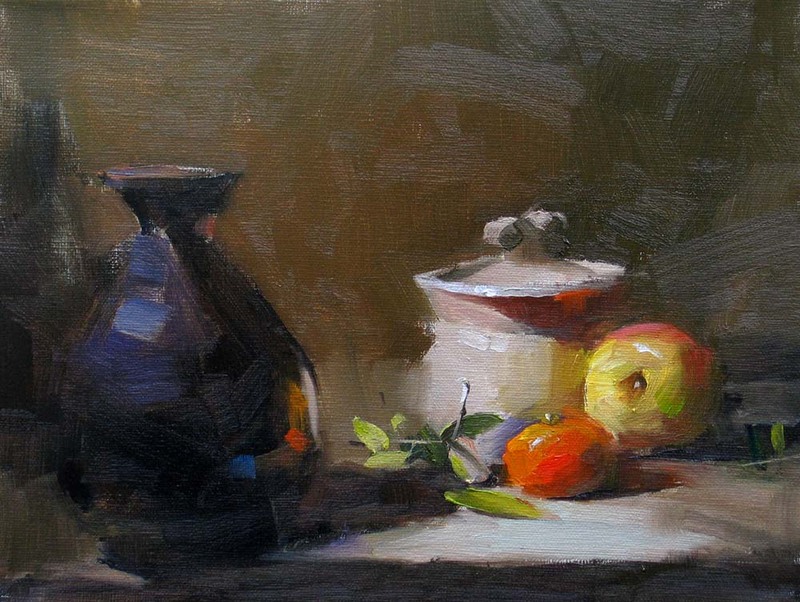 I have used some of my study results I obtained from investigating how to paint colors of white objects. It works. If the spring has not arrived at your place yet, I hope this painting will bring some warm air to you. 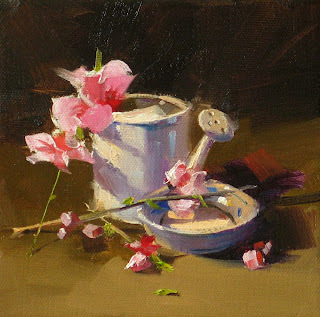 I will teach a 3-day still life painting workshop at Magnolia TX (near Houston) from March 26 to March 28. We still have a few openings. If you are interested in this workshop, please contact Marty Hatcher at mart4art2@sbcglobal.net . I really can’t believe it. I did this painting on a Tuesday morning - a regular working weekday. About a month ago, I negotiated with my boss that I want to reduce my pay and free some time for my art. To most of engineers, it is rather bizarre to propose something like that. After several push-pulls, I got what I want. Now I am allowed to work 30 hours per week. I am still considered full-time engineer so I can keep my benefit. I am so grateful to the company’s decision. You know I call myself a DAILY painter, but in reality I have been painting NIGHTLY all the time. Man, it surely feels so goooooood painting under day light. Now, I am able to FEEL the spring coming to Texas. I am so happy that life can be this good. I pinch myself to verify that I am not in my dream. I am a little late on my blog posting. This is the second demo painting I did at Dallas. 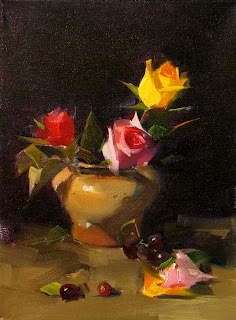 Now, it becomes a routine that I need to show how to paint roses at my workshops. I enjoy doing it too. After I mentioned that my wife's email got hacked, we received many phone calls and emails showing tips and offering helps. We are really touched and feel grateful to all of you. Song has set up a new email account, and our life is coming back to normal gradually. I wish I could articulate our thanks more expressively, but our limited English abilities limit us to do so. The only way I can do is working more on my painting and teaching, and provide better paintings and more effective teaching to assist your progress in art. Thank you. This is my first demo at my workshop at Dallas. I want to thank Mrs. La Rue Hunter and ACA for putting this workshop together. I really enjoyed meeting so many wonderful artists. We had great time in those three days. Once a workshop is over, I usually have a couple of days I can relax my mind (I am always busy physically). However this time, I have no chance. On Wednesday morning, I just checked out from my hotel and on my way out, my wife, Song, called me in the mood of panic. She told me that her email got hijacked. The bad guys sent emails to all the people on her contact list and said that she was in UK and got robbed, she really needed cash, and asked people to send money to an address in UK. Song couldn't login her email account any more. She got a lot of phone calls asking her if this was true. I drove back to the hotel and send a warning message to all my subscribers right away. After I rush back to Austin, we called yahoo to report that Song's email got stolen. You know what, Yahoo did not consider Song was the real owner of her email address, because she couldn't remember the correct answer of one of the security questions. So Yahoo won't help us to reset Song's password, and the bad guys are keeping sending harmful messages to innocent people. I really cross my finger and hope that nobody is losing money because this. Yahoo service people even hung up phone on us. We really don't know what else we can do. In any event, if you happen to be on Song's mailing list and receive email from: yuehongsong188@yahoo.com, PLEASE DO NOT SEND ANY MONEY. If you are registered student of Calvin Liang's workshops, you can contact me to ask questions and we will send you new contact methods. If you have experiences dealing with email problems, please help us. We appreciate it very much.